Since my last post, several people have made the point that it is fine to say what they did wrong, but it might be more helpful to tell them how to fix it. So here goes – do more kihon practice. The first two are the easiest to resolve and in doing so there is a good chance number three will go away, so I will save that for another day. The left hand problem is relatively simple, given that you want to change. Most people can cut correctly when doing basic exercises and drills, but stiffen up when they get into jigeiko. To my view this suggests that we all should do more kihon and less free practice, but back to the point in hand! You get the cutting action right through practicing correct suburi. Try the following:- Stand in front of a mirror, (or get someone to video you), and make sure your posture is correct – back straight, with your balance just slightly forward from perpendicular, feet well spaced and shoulders relaxed. Now look at your kamae. Your left hand should be in line with your navel and your right hand directly in front, touching the tsuba with your knuckle. The point of your shinai should line up with the throat of an imaginary opponent of your own height. Your arms should be relaxed and close to your body but with elbows and wrists relaxed. You should also allow space for your arms to move freely without sticking on your dou. Make sure that you are gripping correctly, hold the shinai with your little finger and ring finger with the rest of your hand loose. Now start suburi with the feeling of pulling up with the left hand to just above your men. The point of the shinai should not go back too far, 45 degrees at the most. When you make the strike, ensure that your left hand always stays below your right, but that you extend your right wrist so that the eventual destination of the shinai is the chin of your opponent, squeezing gently with your right hand just after reaching the top of the men. Ensure that you lift and strike in one continuous movement and that your hands are turned in rather than out. Finally come to a complete stop after each cut and ensure that your balance and posture is right before the next. 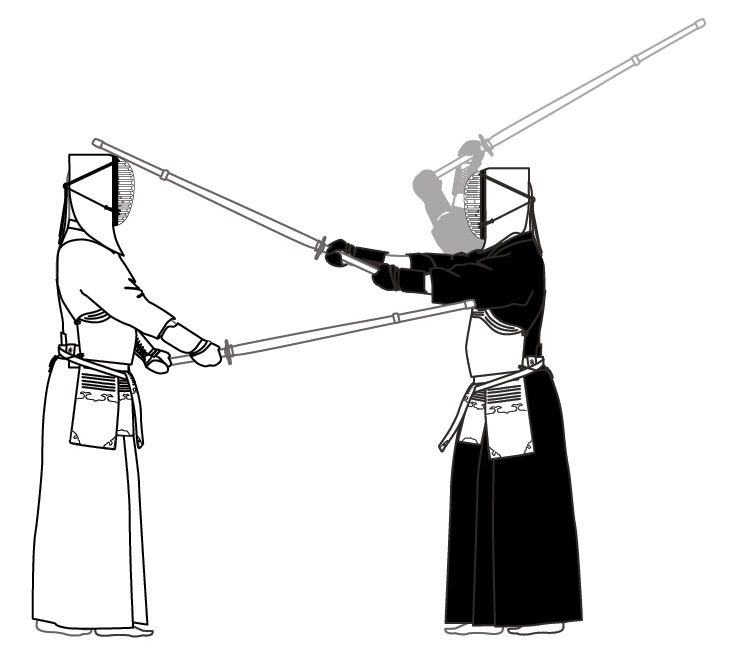 This can be done in pairs, taking turns to hold the shinai above your head and stepping backwards and forwards for your opponent to make renzoku suburi. Chiba sensei suggests doing this in a set of 200, so you keep relaxed from the outset. To my mind the best way to fix the drive from the left foot, is to work in pairs, wearing men and kote. Face each other in issoku, itto maai and build pressure between you with strong kiai and kamae. Ensure posture and kamae are correct, then kakarite should move his weight from 50:50 to 70:30 left foot : right foot and also 70:30 between ball of foot and heel on the left foot. 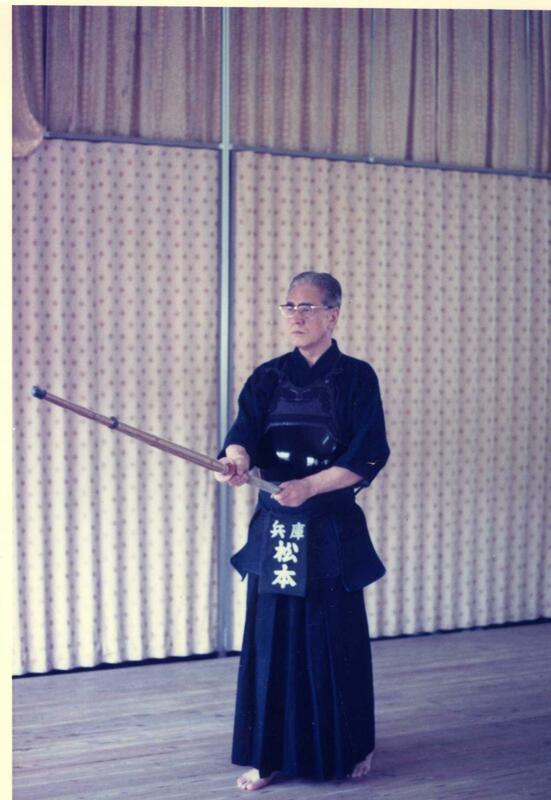 When motodachi feels that pressure has built to a maximum, he or she should make a small step forward on the right foot, opening their kamae and inclining their head forward. Kakarite should instantly push off from the left foot and strike in one action. Practise this in sets of four or five changing motodachi after each set. Now you have the perfect debana men – which should keep you going until you make hachidan. Matsumoto sensei on chudan and men attack. I had a really interesting email from David Pan of Seattle, who saw my mention of Matsumoto Toshio sensei and wondered if I could identify a xeroxed book by Matsumoto sensei. I believe that the book was published posthumously from notes on lectures given at Matsumoto Kenshyukai in the 70s and 80s. As one of the 21 members of this group I have many of the original notes, but unfortunately my reading and writing abilities are close to nil. However I did find several translations by the late Yamamoto Hisami sensei and am posting it here. I have rewritten this fairly extensively, but have tried not to sacrifice accuracy in the interest of readability.